Our optical area has the largest selection of children's eyewear-- designed to fit the full range of sizes from infants to preteens--in Berks County. We also offer an exciting selection of fashionable frames to accommodate our teen and adult patients. We carry the highest quality eyewear for children and adults. Our frame selection is specifically chosen for durability and comfort in addition to fashion. Likewise, our lenses are of the highest quality, and state-of-the-art coatings are available to minimize reflections and scratches. In addition to glasses, we have a full line of specialty eyewear, including prescription swim goggles, sports glasses, and prescription and nonprescription sunglasses for all ages. There is no substitute for experience. 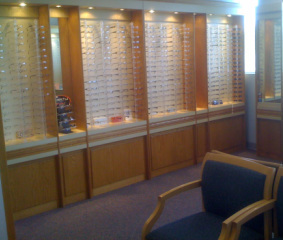 Our opticians are experienced in fitting patients of all ages and all levels of cooperation. They build on that experience through continuing education, so that they may offer you the latest in optical technology. You may be sure that they have inspected your glasses before dispensing them, to ensure that they have been made to our exacting standards. Appropriate adjustment of the frame when eyewear is dispensed is important to comfort and successful wear. Children will outgrow the frame size in the same way they outgrow shoes and clothing. Please have the fit of your child's frame checked often. Adjustments and minor repairs are always free of charge. Our free one-year warranty includes a one-time replacement of scratched lenses if the scratches interfere with the patient's vision. In addition, frames with manufacturer's defects will be repaired or replaced at no charge within one year. As with all valuable pieces of medical equipment, glasses should be handled with responsible care. Naturally, we cannot warranty loss, or damage that occurs due to carelessness. We offer a 20% discount on additional prescription eyewear for immediate family members within 90 days of the original order. This discount applies only to complete pairs of glasses. We cannot offer a discount on contact lenses. However, non-prescription sunglasses are available at a 15% discount for our contact lens patients.